In marketing and sales, the common concept is that we’re here to solve a problem for our customers — and I don’t agree. Oh I’m here to help and serve, don’t get me wrong. But there’s two fundamental flaws in the problem-solving approach. Why start out with a negative? 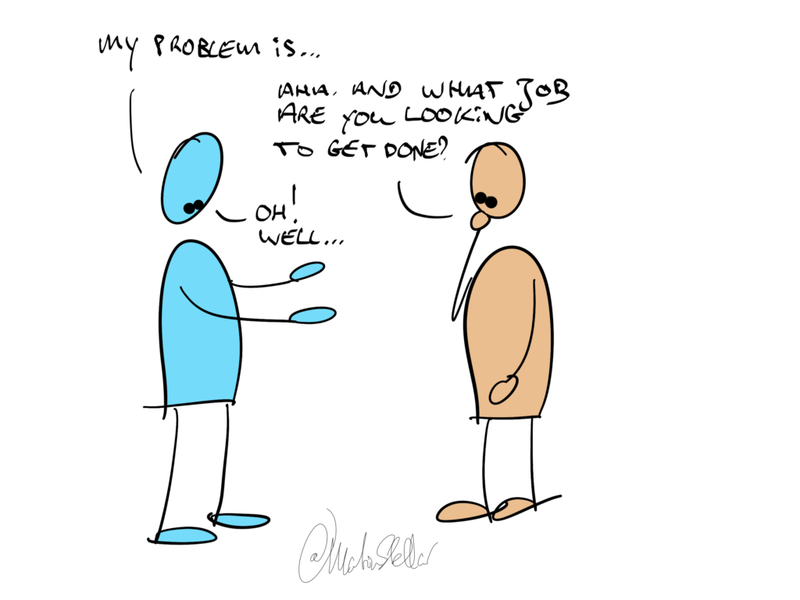 It’s much more fun and far more effective to reframe a customer’s need in terms of ‘job to be done’. You might think I’m nitpicking on idiom, but the mindframe in the two cases is very different, and makes for very different processes. Think of a patient, talking to a doctor. If it’s ‘I have a problem and I want it cured’, that’s where the conversation will go. But if it’s ‘I want to be healthy, and I’m not because of ailment x’, the conversation will address the ailment, but also look at the bigger picture of what it means to be healthy. My second objection to the problem-solving point of origin, is that if your thinking and inquiring is into what problem a potential buyer has, you’ll be working with two sets of assumptions: yours, and theirs. If a client identifies a problem and asks if you can solve it they assume (by nature and default) that the definition of the problem is what the thing is. But behind every problem is always another problem, an underlying cause, and looking at how to solve that problem can easily skip over the unseen elements. “I have problem x”, they say, and you go “Well, my product or service fixes that”. Not much joy. They might buy, they might not. Meaning: aside from solving the problem, what overall outcome are they looking for? If they want more website traffic, what consequences does it bring for them, beyond a higher number in a dashboard? If a client wants spiffy ebook design, what set of outcomes are included, in getting that job done? In other words: your job isn’t to solve a problem… it’s to *find* a problem — that way, you’ll be able to convert clients because they’ll know that you get the bigger picture, the overall holistic impact you’ll have on their life or their business. Forget problem-solving, and become good at problem-finding. And you do that by taking on the attitude of the investigator, the researcher, the anthropologist. More on that over the next few days, where I’ll give you insight in the 9 pillars of my LEAP sales system. If you were to hire a sales coach (hi! ), what job would you want to get done? What else? What else?